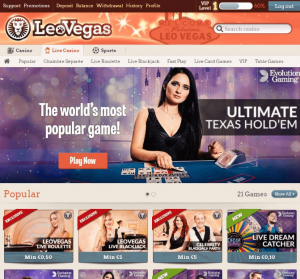 Leo Vegas, the Swedish online casino operator, boosted its revenue greatly in the last quarter (Q4). The increase was more by two thirds in comparison to the previous season, and at the same time, the casino operator positioned itself well and joined a regulated German online casino market. On the 7th of February, Leo Vegas casino made a report to the media stating that their revenue increased to nearly AUD$67,8 million in the past three months that ended in December 2017. However, the casino operator did mention that they also faced a couple of downfalls in that same quarter. The total earnings went down by 39% to AU$6.1 million, and the operating profit fell to 78%. Leo Vegas blamed these downfalls on extra costs that were associated with the acquisition of the Royal Panda online casino that happened in October 2017. For the whole of 2017, Leo Vegas’ total revenue increased by 43% to AU$217 million, while adjusted earnings also increased by 31% to AU$27,9 million. In addition, the total operating profit for the whole year improved by 36, 3%; making it total of AUD$19,9 million. Moving onto the New Year, Leo Vegas further reported to the media that things seem to be going in the right direction. The online casino has already started off on the right foot as the total revenue for January was AUD$24,8million. This means that it increased by 76%, comparing to the same period, last year. Gustaf Hagman, the Chief Executive Officer of Leo Vegas online casino, hailed their Q4 results as being the best quarter ever as it came with a substantial underlying increase of 82% and at the same time, the number of depositing players also increased by 50%. Lastly, Hagman added that the company has been working very hard to sustain the sports betting product as they are approaching the oncoming FIFA World Cup season. Leo Vegas casino has done well for itself in 2017. Since this new season has already started on a good note for them, online casino players are also expecting nothing but the best!